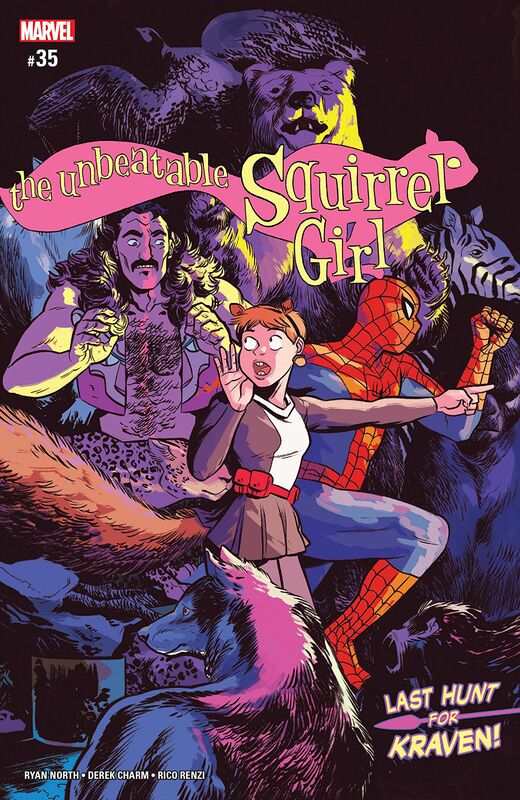 The Unbeatable Squirrel Girl #35 review: With great power… – AiPT! As always, Unbeatable Squirrel Girl is a must for your pull list, no matter your age or gender. When last we left Squirrel Girl, she and her pals — including the villainous (?) Kraven the Hunter — were on trial for beating up some cops and generally being bad guys. Things ended well for the heroes, but Kraven was found guilty and escaped from the courthouse only to encounter his greatest foe, Spider-Man. Let the punching/web-slinging commence! Except, that wouldn’t really be Squirrel Girl’s style, would it? Sure, she can beat up the entire Marvel Universe, but violence is almost always her last option. Even worse, in this case, she has to choose between punching everyone’s friendly neighborhood arachnid and the newest potential recruit to her villain rehabilitation program. Having shed his hipster scarf/chinos look in favor of the old-school lion mane/chest hair savoir-faire, Kraven seems to be heading down the dark path his life has taken him again and again. Writer Ryan North spends a great deal of this issue collecting Doreen’s thoughts on the nature of villainy and heroism, finding the common ground between Spider-Man’s more black and white take and Kraven’s innate Russian pessimism about his own fate in life. This is a deep philosophical dive in a medium that often steers head-on into punch first, examine the ethical side of vigilante justice never. North finds the path through admirably, giving a supervillain a much deeper future potential than many have earned. Also, Ryan North should be writing a Spider-Man comic as soon as possible. As he has since taking over the gig from Erica Henderson, artist Derek Charm crafts a compelling story, elevating North’s script — as all good artists should. I will admit to being curious about how his style will play out in, let’s say, cosmic space battles, but for these intimate, team-driven issues, he is knocking it out of the park. How will Charm's art style hold up to big-scale fights or intergalactic travels?